It’s never too early to start thinking about which books might make it onto next year’s Wellcome Book Prize nominees list, open to any medical-themed books published in the UK in calendar year 2017. I’ve already read some cracking contenders, including these two memoirs from British surgeons. Brain surgeon Henry Marsh’s first book, Do No Harm, was one of my favorite reads of 2015. In short, enthrallingly detailed chapters named after conditions he had treated or observed, he reflected on life as a surgeon, expressing sorrow over botched operations and marveling at the God-like power he wields over people’s quality of life. That first memoir saw him approaching retirement age and nearing the end of his tether with NHS bureaucracy. Admissions: A Life in Brain Surgery serves as a sort of sequel, recording Marsh’s last few weeks at his London hospital and the projects that have driven him during his first years of retirement: woodworking, renovating a derelict lock-keeper’s cottage by the canal in Oxford, and yet more neurosurgery on medical missions to Nepal and the Ukraine. But he also ranges widely over his past, recalling cases from his early years in medicine as well as from recent memory, and describing his schooling and his parents. If I were being unkind, I might say that this feels like a collection of leftover incidents from the previous book project. However, the life of a brain surgeon is so undeniably exciting that, even if these stories are the scraps, they are delicious ones. The title has a double meaning, of course, referring not only to the patients who are admitted to the hospital but also to a surgeon’s confessions. And there are certainly many cases Marsh regrets, including operating on the wrong side in a trapped nerve patient, failing to spot that a patient was on the verge of a diabetic coma before surgery, and a young woman going blind after an operation in the Ukraine. Often there is no clear right decision, though; operating or not operating could lead to equal damage. Although some slightly odd structural decisions have gone into this book – the narrative keeps jumping back to Nepal and the Ukraine, and a late chapter called “Memory” is particularly scattered in focus – I still thoroughly enjoyed reading more of Marsh’s anecdotes. The final chapter is suitably melancholy, with its sense of winding down capturing not just the somewhat slower pace of his retired life but also his awareness of the inevitable approach of death. Recalling two particularly hideous deaths he observed in his first years as a doctor, he lends theoretical approval for euthanasia as a way of maintaining dignity until the end. What I most admire about Marsh’s writing is how he blends realism and wonder. “When my brain dies, ‘I’ will die. ‘I’ am a transient electrochemical dance, made of myriad bits of information,” he recognizes. But that doesn’t deter him from producing lyrical passages like this one: “The white corpus callosum came into view at the floor of the chasm, like a white beach between two cliffs. Running along it, like two rivers, were the anterior cerebral arteries, one on other side, bright red, pulsing gently with the heartbeat.” I highly recommend his work to readers of Atul Gawande and Paul Kalanithi. Admissions: A Life in Brain Surgery was published in the UK by Weidenfeld & Nicolson on May 4th. My thanks to the publisher for sending a free copy for review. It will be published in the USA by Thomas Dunne Books on October 3rd. What Marsh does for brain surgery in his pair of memoirs, Professor Stephen Westaby does for heart surgery in Fragile Lives, a vivid, compassionate set of stories culled from his long career. A working class lad from Scunthorpe who watched his grandfather die of heart failure, he made his way up from hospital porter to world-leading surgeon after training at Charing Cross Hospital Medical School. Each of these case studies, from a young African mother and her sick child whom he met while working in Saudi Arabia in the 1980s to a university student who collapses not far from his hospital in Oxford, is told in impressive depth. Although the surgery details are not for the squeamish, I found them riveting. Westaby conveys a keen sense of the adrenaline rush a surgeon gets while operating with the Grim Reaper looking on. I am not a little envious of all that he has achieved: not just saving the occasional life despite his high-mortality field – as if that weren’t enough – but also pioneering various artificial heart solutions and a tracheal bypass tube that’s named after him. Like Marsh, he tries not to get emotionally attached to his patients, but often fails in this respect. “Surgeons are meant to be objective, not human,” he shrugs. But, also like Marsh, at his retirement he feels that NHS bureaucracy has tied his hands, denying necessary funds and equipment. Both authors come across as mavericks who don’t play by the rules, but save lives anyway. This is a fascinating read for anyone who enjoys books on a medical theme. Fragile Lives: A Heart Surgeon’s Stories of Life and Death on the Operating Table was published in the UK by HarperCollins on February 9th. I read a public library copy. It will be published in the USA, by Basic Books, under the title Open Heart on June 20th. Two of my library reads from this month were about different aspects of mind–body medicine. I expected them to overlap more than they did, actually, and hoped that the second might serve as a sort of well-written rebuttal to the first, but in the end they stayed in different camps: the first is about psychosomatic illness and psychiatric treatment, while the second is about the placebo effect and how alternative and holistic treatment strategies might be complementary to orthodox medical approaches. Both gave me a lot to think about. O’Sullivan is a UK-based neurology consultant. I picked this up on a whim because I knew it had won the Wellcome Book Prize, as well as the Royal Society of Biology General Book Prize. The conditions she writes about go by many names: psychosomatic illnesses, conversion disorders, or functional conditions. In every case the patients have normal neurological test results – they do not have epilepsy or nerve damage, for instance – but still suffer from seizures or lose the use of limb(s). Their symptoms have an emotional origin instead. Many of her patients are outraged by referral to a psychiatrist, as if they’re being told they’re making it all up, but it’s actually a holistic approach: acknowledging the influence the mind has on how we feel. Along with cases from her own career, the author writes about early doctors who developed the science of conversion disorders, including Jean-Martin Charcot and Sigmund Freud. I read the book very quickly, almost compulsively; these are fascinating stories for anyone who’s interested in medical mysteries. That’s in spite of the fact that O’Sullivan does not strike me as a natural storyteller: her accounts of patients’ cases are often no more than just one thing after another, and in reports of her own conversations with patients she comes across as robotic and not always very compassionate. Ultimately I believe she does empathize with those with psychosomatic illnesses – otherwise she wouldn’t have written a whole book to illuminate their plight – but it would have taken the writing skill of someone like Atul Gawande for this to be a better book. I’m somewhat surprised it won a major prize. Note: Chapter 7 tackles CFS/ME/fibromyalgia. These are controversial fatigue disorders, and O’Sullivan is aware that even mentioning them in a book about psychosomatic illnesses is “foolhardy to say the least.” I don’t think what she actually has to say about these conditions is offensive, though (and I say that as someone whose mother struggled with fibromyalgia for years). She allows that there may be physical triggers, but that emotional wellbeing and traumatic experiences or regular stress cannot be overlooked. In this absorbing and well-written work of popular science, Marchant, a journalist with a PhD in genetics and medical microbiology, investigates instances where the mind seems to contribute to medical improvement: the use of placebos in transplant recipients, hypnosis for IBS patients, virtual reality to help burn victims manage pain, and the remarkable differences that social connection, a sense of purpose, meditation and empathic conversation all make. On the other hand, she shows how stress and trauma in early life can set (usually poor) people up for ill health in later years. She also travels everywhere from Boston to Lourdes to meet patients and medical practitioners, and even occasionally proffers herself as a guinea pig. A relentless scientist, Marchant is skeptical of any claims for which there is no hard evidence, so when she acknowledges that there’s something to these unusual treatments, you know you can believe her. As Jeremy Howick of the Centre for Evidence-Based Medicine, Oxford puts it, “I think it’s more important to know that something works, than how it works.” I finished the book feeling intrigued and hopeful about what this might all mean for the future of medicine. The problem, though, is that most medical trials are funded by big pharmaceutical companies, which won’t be supportive of non-traditional methods or holistic approaches. Do these books appeal to you? Do you have any experience of psychosomatic illness or mind–body medicine? This is an epic adventure starring four unlikely heroes: two middle-aged doctors, Gregory Pincus, fired by Harvard, and John Rock, a Catholic; and two older ladies, Margaret Sanger, who left her first husband and family and grew increasingly addicted to alcohol and prescription pills, and Katharine McCormick, whose mentally ill husband died and left her with a huge fortune she dug into the birth control movement. Dr. Gregory Pincus is on the left (date unknown). Copyright Mrs. F. Hammond. From testing progesterone on rabbits to the desperate hunt for human test subjects in Puerto Rico and in a Massachusetts mental hospital, it is a tale full of surprises. When first presented to American doctors and the FDA, the contraceptive pill – then known as Enovid – was billed as an infertility drug: It regulated periods to make it more likely that women would then get pregnant after going off it. Pincus et al. conveniently failed to mention that it also prevented ovulation. I never would have expected a Trojan horse story. Margaret Sanger was given a hero’s welcome on every trip to Japan, but she also had an unfortunate association with the eugenics movement – an inevitable offshoot of concerns about overpopulation? She once said that parents should have to apply for the right to have children just like immigrants have to apply for visas. The best random piece of trivia I came across here was that Prescott S. Bush, father of George and grandfather of Dubya, was the treasurer for Planned Parenthood’s first nationwide fundraising campaign in 1947. You can bet the Bush family has tried to cover that one up! “Religion is a very poor scientist,” John Rock was known to say. 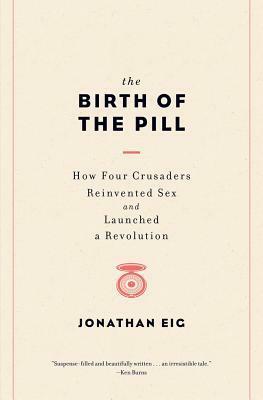 The fight to have the Catholic Church change its position on birth control is an important background narrative in this book. The sexual revolution and the personal decision to contravene Catholic doctrine regarding contraception is also a major component of Quite a Good Time to Be Born, David Lodge’s recent memoir. It’s always fun when similar ideas come up in multiple books at the same time. Jonathan Eig was previously known for his sports biographies, and there’s plenty of action and narrative here. Like the best science writers (Rebecca Skloot in The Immortal Life of Henrietta Lacks, David Quammen in Spillover, Atul Gawande in Being Mortal, or Siddhartha Mukherjee in The Emperor of All Maladies), he tells a story rich with three-dimensional characters. We have a family legend about a Swiss ancestor who admitted herself to a mental asylum (then euphemistically called a sanatorium) in upstate New York in 1922 rather than have more children. She already had nine kids (one more died in infancy); she was tired and overworked. If this was what it took to keep her husband from making her pregnant again, so be it. She and thousands of housewives like her never could have guessed that one day (in 1960, to be precise) a simple pill could limit their family size. This is what this book is all about: the quest to give women control over their lives.